Tom Mechler has won re-election as chairman of the Republican Party of Texas. 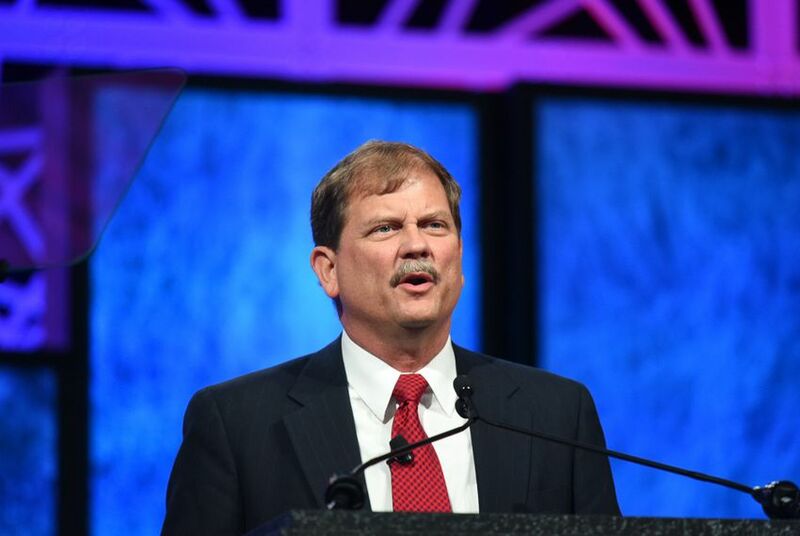 DALLAS — Tom Mechler has been re-elected as chairman of the Republican Party of Texas, fending off a spirited challenge from Jared Woodfill. Woodfill, former chairman of the Harris County GOP, conceded the race Friday morning, asking delegates to rally behind Mechler here at the party's convention. “With respect to the chairmanship, that fight needs to end right now, and we need to unify the Republican Party going forward,” Woodfill said. "It is my privilege and it’s been my privilege to run and to meet so many of you, but it is now time for us to get behind the next chairman of the Republican Party of Texas, Tom Mechler." Mechler had won overwhelming support from delegates in state Senate district meetings held earlier Friday morning, carrying all districts but a few, according to people involved in the process. Amy Clark, the current state party vice chairwoman, won re-election. She was being challenged by Cathie Adams, former president of the Texas Eagle Forum, who was running on a ticket with Woodfill. In his challenge to Mechler, Woodfill had argued the chairman should be a more forceful voice for conservative values. Mechler had warned delegates that electing Woodfill would imperil the financial health of the party. Mechler had criticized Woodfill for his management of the Harris County GOP. Mechler became interim chairman of the party after Steve Munisteri stepped down last year to work on Rand Paul’s presidential campaign. In his bid for re-election, Mechler had the backing of Munisteri.